This week ends with the American Craft Council's annual show in Saint Paul, a show that my DH and I never miss. I'm sure we'll be running into customers who sell there, as well as Chickie and the Chickie Mama who usually also attend the show on Sunday mornings. We have to work Saturday, of course, but Sunday will feature beautiful things. So I am sharing the four winners of the Award of Excellence for the show this year, just to share the pretty things. 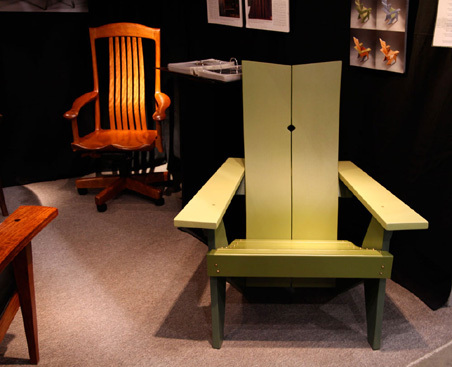 The first artist is Robert Erickson who builds beautiful furniture. He has exhibited at the show since it started in the mid-1980's. Just look at the exquisite lines of his chairs. I've always loved his things, but my home really isn't the place for furniture like his. I can still enjoy looking though. 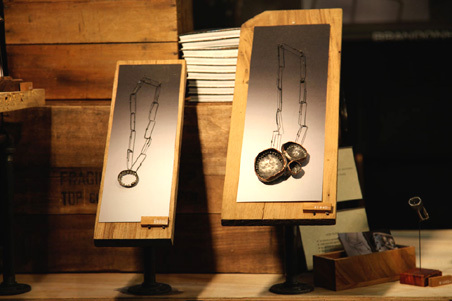 The second artist is Tiana Kim who works with her husband, producing beautiful jewelry with a wonderful, organic feel. I'm looking forward to getting a much closer look at their pieces. 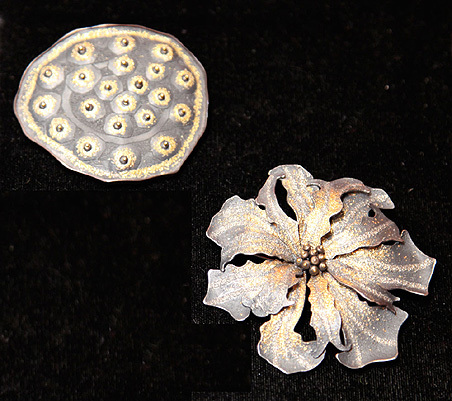 The third awarded artist is Rebecca Hungerford who works utilitarian pieces in pewter. 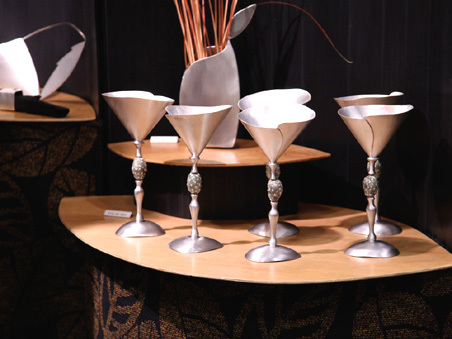 She makes bar ware, serving pieces, and silverware and just look at those goblets - just stunning. If only I entertained. Then I could justify buying something like this. But for me they would just sit around, looking beautiful but gathering dust *sigh*. And the final artist is Brandon Holschuh, a new artist this year. He was awarded his prize for his booth design which isn't the focus of the picture here. What he did that made his booth so unique is that he crafts a unique display piece for each piece of jewelry he designs. When you buy a piece of his, you are not only buying the necklace, bracelet or ring, you are also buying the display stand that it is presented on. Really lovely. I can't wait to see some of his presentation pieces. So that will be my Sunday. I'm already looking forward to it. I really love them. I can hardly wait to see them in person tomorrow. What beautiful items - especially the wine goblets and flower jewellery. The quality of items at the show is always so worth seeing. I anticipate a lovely Sunday. What a nice way to spend a Sunday. Yes, I can hardly wait until 5pm today when my weekend officially starts - LOL. Great stuff, thanks for sharing. All these pieces are beautiful, and I especially like the flower jewelry and the goblets. I love the idea of asymmetric, organic-looking designs in non-organic materials. I'm really looking forward to the show. I've been attending it annually since the mid 1980's. Oooh, very nice. I love those goblets! I think they'd be right at home in Tom Bombadil and Goldberry's house. The goblets have my vote as well. I wonder what the rest of his work looks like? I don't know, but I know I'm looking forward to seeing whatever I can. I anticipate a lovely Sunday.